This studio condo has a beautiful view of Molokai and partial ocean view which is great for a romantic couple or for a small family getaway. There is central air-conditioning, a full open kitchen with a large counter, separate eating table, new range, new dishwasher, and microwave, new 32 inch flat screen TV, DVD player, a new California king-size bed and a new Full size sofa bed (no bar in your back, tempurpedic mattress), new wood flooring, with a lanai (balcony) to enjoy sunset views. This condo has been upgraded! All new furniture and a new couch!. All new kitchen and bath tile, new counters, new cabinets, new bathroom vanity, new paint, new artwork and so much more! When you arrive at the Kaanapali Shores open air lobby with exotic island decor and waterfall, you will know you have reached your dream destination! As you stroll past the waterfall, there is a quiet garden pool with jacuzzi. After passing garden flowers and palm trees, there is the convenient Beach Club restaurant overlooking the adjacent beachside pool and ocean beachfront. Here is a a virtual tour of the resort: https://youtu.be/w0ptM0hsOUM. The resort has full hotel amenities, including: updated fitness center; cardio are with TV monitors; coffee bar; outdoor massage; floral shop; gift shop; mini shop (beverages, snacks and sundries); concierge service (to set up island adventures and information on local activities and dining), and a children’s program. The resort offers onsite parking in a garage adjacent to the condo units. The costs is $9 per day, payable to the resort. In addition, there is a shopping center across the street with a supermarket, coffee shop, multiple gift shops and more. Two blocks north is a farmer's market. The Whaler's Village shops and restaurants are only 2 miles away and the town of Lahaina with shops and restaurants, theater, and island adventure activities is only 4 miles away (a 5 to 10 minute drive). There are also four golf courses nearby (Kaanapali North, Kaanapali South, Kapalua Bay, Kapalua Plantation). Been traveling to Maui 1-2 times per year for the last 12 years. Love the west shore of Maui (where condo is located) due to great beaches, beautiful sunsets, ocean breezes, excellent shopping, great restaurants, two golf courses, and close to popular Lahaina (features restaurants, shopping, arts community and more). Beautiful resort with lush well-kept grounds, featuring two pools, tennis courts, fitness center, and many on-site shops. Across the street from major grocery store and other shopping. Great beach. Incredible view of Molokai. Unit is stocked with everything you need for a great visit. We also provide a cooler and beach chairs! Large vanity with sink and large closet. Shower with tub. Quiet AC unit with thermostat allowing you to set a comfortable temperature. Clean sheets and towels provided at check in. No maid service. Washers and dryers available on floors 3, 7 and 9. On site parking garage. Cost is $9 per day payable to the resort. Fully equipped two story workout room on site. Full size dishwasher and detergent provided. Full size electric stove and oven. Pans, bowls, Tupperware, plates, bowels, silverware, cooking utensils. Fully-equipped kitchen with toaster, blender and coffee maker and all plates, bowls and dishes needed for cooking. Flat screen TV with remote and cable TV service. There are four golf courses nearby (Kaanapali North, Kaanapali South, Kapalua Bay, Kapalua Plantation). Two large pools on complex. 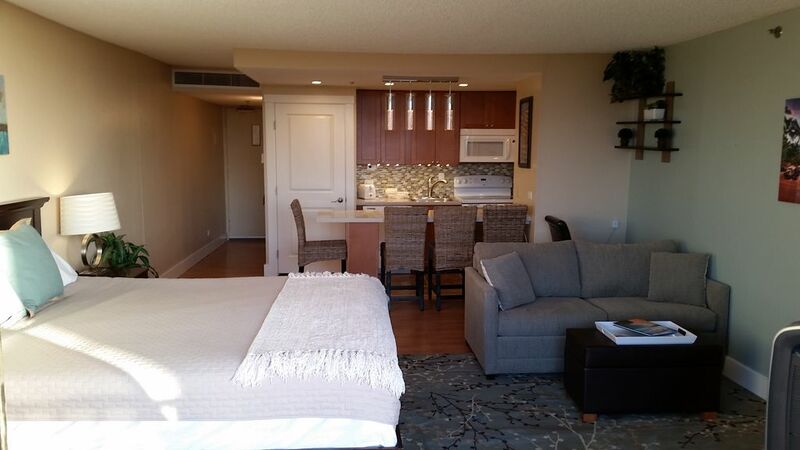 2nd time we stayed at Kaanapali Shores, 1st time in this unit, & we absolutely loved it!! Scott was extremely professional, & made our stay so pleasant. Unit was perfect for the 2 of us- clean, comfy, & boogie boards too!! & lots of other things as well!! Resort staff are above & beyond, super friendly & helpful!! We loved our stay at Scott's place in Kaanapali Shores. The condo had everything we needed from a stocked kitchen to beach chairs. The space was adequate and we enjoyed the balcony with ocean view for coffee/breakfast. The complex is older, but this condo has been fairly updated. The pictures are a good representation of the space. The property has 2 great pools, but no real beach to speak of as the water comes pretty much up to the wall/walkway. You can walk to a market and few things across the street but most everything was a 10+minute drive (good restaurants, etc.) so just plan on that. The only suggestion we would have is to consider an upgrade on the bed/bedding eventually. It was clean and we slept fine, but it could use an upgrade at some point. Highly recommended! My husband and I really enjoyed the resort. We loved getting coffee at Java Jazz across the street, my husband also thought their loco moco was the best of all the ones he tried this week. The grocery store is across the street too. I didn’t cook, because I cook at home, and my goal on vacation was to NOT cook. Scott was very responsive and easy to work with. The condo Is nice, it looked fully stocked with whatever utensils you need if you did want to cook. We could enjoy the sunrise in the morning from the front door balcony and the balcony from inside had a great view of the ocean. The noise from the workers below, that others mentioned, was hardly noticeable, but we weren’t there during the day anyways. The garden pool area was really nice. We went to the conceirge presentation on our first morning and decided to book the excersion to Molokini Island on the Maui Magic. It was awesome! We even got to see a whale and dolphins. Truly epic. I also enjoyed going to yoga on the beach. It is $10 each time, if you like working out in a group setting like me. The gym looked nice with alot of good machines to work out on. Overall, I give our stay 5 stars! Mahalo Scott! We loved it! The room, pool, quiet location.. great property! We loved the location, the property amenities and the room was perfect. We had a great view of the ocean and mountains from our balcony. We will definitely be back. This unit delivered everything as advertised and was very comfortable for two adults and two kids. The bed and pullout couch were great and the nice kitchen made having breakfast very easy. The unit is well stocked with lots of conveniences such as a coffee maker, microwave, cups, plates, cable tv, air conditioning as well as snorkeling gear. The building is great, with two pools and lots to do in the immediate area. Across the street from the building is a small plaza with a grocery store and several casual restaurants that all came in handy during our stay. The unit is not overlooking the beach or pools, however that makes it very quiet at night and good for not being disturbed by night owls. Overall it was very convenient and enjoyable. Nicely updated, well laid out floor plan. Very well stocked unit, down to really high quality snorkel gear and everything you need for a day at the beach. We didn’t have to rent snorkel gear - awesome savings of money and time. We were able to walk to airport beach and snorkel at 7 am our first morning of the stay and got a bonus snorkel trip in. The unit has a good ocean view. We like being on the ‘back’ side of the property instead of courtyard facing- better privacy. Love the keyless entry and the pool updates since we have stayed at kaanapali shores. Great accessibility to beaches, boardwalk, grocery store and restaurants across the street, farmers market and great health food market a short walk away. If you like to get out and walk....great snorkel site just over a mile away on the boardwalk. We take a cup of coffee, walk to an early morning snorkel on the boardwalk, snorkeling at airport is usuually amazing early am, and walk back on the beach - heavenly. You can walk the whole length of the beach past black rock on the boardwalk/beach path all the way to whalers village - 3 miles or so one way. Happy hour at Leilani’s and walk back during sunset. (Also easy to drive and park there...but we love the walk). One of the nicest studios we have seen at this property, we will be back. Thanks!